We rewind to when Jiwon was preparing her fail dinner. 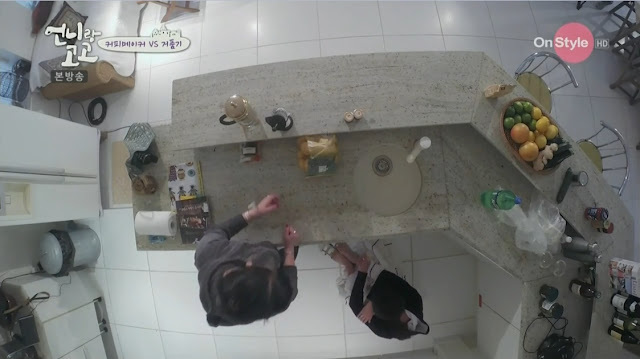 There's this sequence of Jiwon staring at stuff in the kitchen looking confused, preparing coffee, washing dishes, keeping dishes and looking confused again, then washing more dishes before she finally starts working on her kimchi pancake. I love the question marks that the editor puts haha. She's so adorable when confused. And she uses this machine to make coffee. This is important! Meanwhile, Yookyung has been preparing ingredients to give Jiwon a special foot massage! Because as an actress, she often has to wear high heels so her feet is often hurting and uncomfortable. And as they like giving names to stuff, this pack is called 'the sea's heart pack' hehe. Jiwon tells her sister that she was a bit depressed just now, not because of her cooking, but because she had to do things like cooking and taking care of the house (putting firewood etc) and she realised it's not easy. Furthermore her sister told her that her pancake was salty and tried to prevent her from driving. Yookyung: How can you be good at everything? This whole scene between the sisters is super sweet and gives me warm fuzzy feelings. Despite all the snarky comments Yookyung makes, she loves Jiwon a lot and takes good care of her. In an interview, Jiwon starts crying, saying that she regrets that it was obvious that she was annoyed. "What is kimchi jeon anyway...."
Yookyung gives Jiwon a leg massage and she ends up falling asleep on the sofa. Yookyung then cleans up everything. Btw, the song that plays in the background for this whole scene is Natalie Lungley's Wonderwall. The next morning, Jiwon wakes up and she goes "Oh my god!" at the colour of the sky. Next, she goes outside her house, and makes cute noises while trying to open the door lol. She twirls a few rounds outside then goes back in and has a huge problem closing the door hahaha. More cute noises. She has to put down her camera to close the door with both hands in the end. While having breakfast outside, Dominique comes over to show her baby tortoises. One of the tortoises moves in her hand and she screams at it hahaha. And then Jiwon goes to find the donkey! She just goes "donkey! donkey ah! donkey!!" In an interview, I think she's asked why she was so attracted to the donkey. "I don't know either....my heart. The donkey is like my boyfriend. I kept thinking of it, whether it slept well, how's its condition today." I just can't believe she called that donkey her boyfriend lmao. Yookyung finally wakes up and they're headed to the supermarket again! They meet Dominique and John there, so Jiwon asks them to recommend good wine. Dominique recommends 2 bottles then Jiwon goes "More!" And they end up buying 7 bottles :OOOOOO My gosh, I fear for their livers. I really hope they shared it with the production crew. They then go to the delicatessen and Jiwon tells the butcher "You're handsome!" and he gives them extra meat hahaha. A random lady decides to ask to take a picture with Jiwon. I think she doesn't know who Jiwon is, but just took a photo with her since she was being filmed and was clearly a celebrity. But anyway, so lucky!!! When they reach back home, DJ Jiwon makes an appearance while her sister brings in all their shopping. So Jiwon decides to help, only she can't lift the bag cos it's so heavy hahaha. Really no strength. She wants to find a coffee maker, and this is the start of the hilariously absurd argument between the sisters. 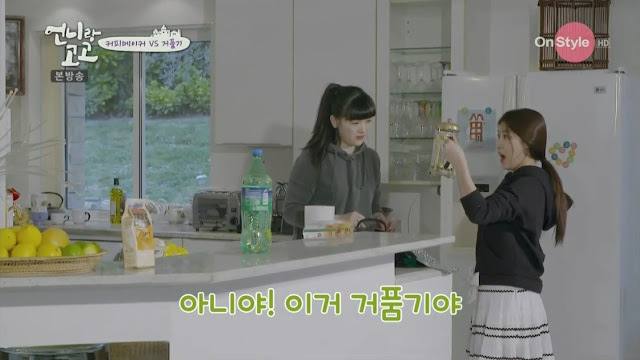 Jiwon finds the machine that she used earlier to make coffee. Yookyung: No, this is a foam maker. Yookyung: It's a foam maker. Jiwon: Noooo. Let's bet 100000won. So they decide to ask the production crew but they don't know either. Jiwon: Do you see the label here saying it's for coffee? But Yookyung refuses to concede defeat. "You put in milk here and press it and it'll become foam!" Jiwon takes out her phone and does a search and is convinced that she has won. Then Yookyung brings a smaller version from her side of the house and proves that this thing can be used to make foam! But Jiwon refuses to concede defeat either and shows that it shows up under the search coffee maker. Yookyung: It's a coffee maker, but an accessory of the coffee maker. Jiwon: ?????? So the big one is a coffee maker but the small one isn't? But it's the same!!! Yookyung: But it can make foam! Jiwon: Then what's its name? Yookyung: The big one is coffee maker, the small one is coffee foam maker. Jiwon is laughing so hysterically that she just falls to the ground. She even has to go to the washroom to wipe her tears from laughing lolol. So since they both refuse to concede defeat, they decide to take a picture and ask someone. It's 3am in Korea, but Jiwon decides she can do it by uploading it on her instagram. Which is how it turns up on Jiwon's instagram. She reads out the replies - "Isn't this for coffee?" "Done. I've won." Yookyung: No I can't admit it. So after spending like half an hour arguing about this stupid machine, they finally get to making dinner. While drinking wine. My gosh, these alcoholics haha. 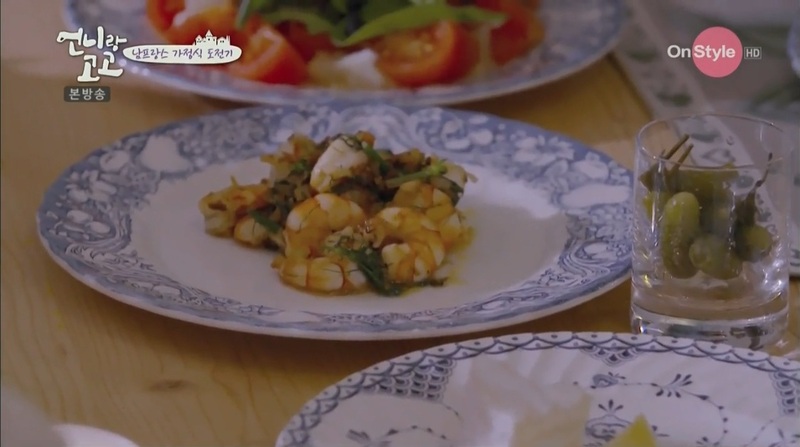 They're making a prawn dish so Yookyung teaches Jiwon how to peel prawns. Jiwon: Ahhh...remove all the clothes? "But it's a waste :( The head is delicious." And then Jiwon decides that her unnie should peel prawns while she'll cut the garlic. Yookyung: No, I'll cut the garlic. Jiwon: I'll cut the garlic. Yookyung: Ok cut one and show me how you cut it. Jiwon: -spies the image of how to cut garlic on the recipe book- I learnt! See. And she fails cos she has no strength to crush the garlic. While scaring me and everyone because the way she handles the knife is so dangerous. Yookyung shows her an example and Jiwon tries again, succeeding this time but omg she's gonna injure herself one day. And like 2 seconds after she starts cutting the garlic, "I'm going to do the salad." Yookyung: Why do you keep changing your mind?? "I want to be good at cooking too. Like Cha Seung Won oppa." Hehehe it's so endearing how she tries so hard but fails terribly at it. When they're finally done preparing the ingredients, they realise the stove is off so they have to call Dominique to help them fix the problem. They finally start cooking, and it's a mess again cos they haven't dried the prawns but it's time to put them in. And then Jiwon screams and it looks like oil splatters onto her face. But turns out it was nothing at all and she was just screaming haha. The finished product!! Jiwon is very pleased at the success after the first cooking failure. But I can't believe this is dinner for 2 people?? A few prawns and a few tomatoes? No wonder she can maintain her figure. After dinner, they go out to stargaze, and that's the end of the ep. It seems like all they did this ep was cook dinner. That's why the editing is strange! But seriously, Jiwon cooking is hilarious. I think she spends more time laughing and screaming in the kitchen than actually cooking haha. Plus that super ridiculous argument about that machine which is a.....French press which can make coffee and foam so they're both right! That scene really must be seen cos I can't describe how hilarious she sounds while laughing. It's like she was hyperventilating haha.